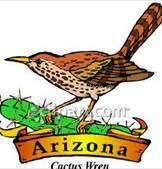 The Arizona state bird is the Cactus Wren. An Arizona State bird is small. The Cactus Wren is only 7 to 9 inches long. The Cactus Wren likes to build nests in the protection of thorny desert plants. A Cactus Wren will build many nests. However it will only live in one. The rest are just decoys. The Arizona legislature adopted the Cactus Wren as the Arizona State Bird in 1973. Interestingly, the Cactus Wren is a bird not know to Audubon during his life time. Therefore it was not included in the 1840 edition of Birds of America. Cactus Wrens are native to the arid south western United States. They also spend time in central Mexico. Cactus Wrens primarily eat insects. Ants, beetles, grasshoppers, and wasps are favorites. They will also occasionally eat seeds and fruits. The water they drink is almost exclusive obtained from its food. A little know fact is that as a true bird of the desert, the cactus wren rarely drinks free standing water. Even when standing water is available. The cactus wren is often found around yucca, mesquite or saguaro cacti. Cactus wrens nest in cactus plants. Using a hole in a saguaro or other spot where prickly cactus spines provide protection for the nest. Male and female cactus wrens mate for life. They are very similar in appearance. They aggressively protect their established territory. This is where they live most of the year. The Cactus Wren will aggressively defend their nests from predators. Cactus wrens also destroy the nests of other bird species, pecking at or removing their eggs. A Cactus Wren is easily seen and is less shy than most other wrens. It has the same loud voice characteristic of other wrens. It has a harsh and unmusical song. It has a slightly curved bill, brown head with a white eye stripe, barred wings and tail. The tail feathers are spotted which makes it easy to identify. Unfortunately, the population of the Arizona State bird has declined. Large-scale development throughout the Southwest has caused declines in cactus wren populations. While they are harder to find, they are still a beautiful bird. A great place to see the wildlife of the Sonoran Desert is at the Arizona Sonora Desert Museum. Moving to Tucson Or Looking for Property in Tucson? We Can Help!